The full results of the day. 500M pool swim – 22km bike ride (2 laps) and 5km run (2 laps). Out of 36 participants only 2 females and none of them are locals. Bike transition point. You can choose anywhere you want to park your bike. You can also bring your own bike stand. 6:44am. Zaeidi and Hamsul getting ready at the far end of the lane. Sofian is waiting for his turn to swim. - 6:59am - As you all can see from the 1st picture above, Hamsul is leading after the 1st transition. According to Zaeidi, Hamsul’s swimming has improved a lot and managed to beat Zaeidi in the swim. His strokes count is less compared to Zaeidi. That means Hamsul swim techniques are much better and economical – Streamlined. Glide like a fish – swim like a fish. That’s the advantage of having a good coach with no coach or lousy coach. 7:16am – Keeran. 7:17am Ahmad Fathi. I was somewhere behind them trying to catch them. 7:17am – a few seconds behind of Ahmad. 7:19 – Zaeidi – still 2 minutes behind me and his catching up. The guy in front of me is Edwin (no 24). He managed to catch me and for 2 laps, we take turns drafting. Every time I’m in front, my speed was around 35km/h and he said I was too fast for him and when he is in front his speed was around 32km/h. It was slow but it was good for me, so I have time for recovery. My bike time was around 42 minutes. 7:22am – Sharif doing his final laps. Sofian Thani at 7:15am just coming out of Panaga. Ahmad Fathi doing his final laps and just few meters to the finishing line. At the final beach run, Zaeidi increase his pace and I decided to follow him side by side but I could not keep up, so I just draft behind him. I know I was already losing the race to him but I’m not going to give up on the run. So with the energy that I still have even though it is not much, I sprinted the last 500m and I expect him to follow me and fight it to the finishing line but he didn’t. So it was a one man show.So I slowed down where I just walk to the finishing line. My final 5km run time was a disappointing 30 minutes. 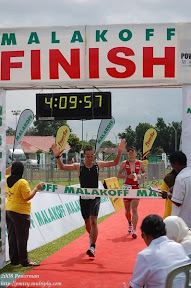 After six time competing in Panaga Triathlon, Zaeidi finally managed to beat me and this year alone he has managed to beat me in all events that we compete. Swimming laju kali bro tapi yang lain lambat hahahah. Cool photos by the way. PNG: satu satu di usai. after swimming, improve your cycling lagi, after that your running. perlahan.